These are some notes from the recent Festival Film Dokumenter (FFD) in Yogyakarta. FFD is an alternative film festival that attracts hundreds of students, young people, videomakers, and artists from across Indonesia. FFD was again a lovely scene and event in Yogyakarta. It's been a year since our last visit to the festival and it was so fun to meet many old friends in the same place. Our friends from FFD gave us two days: Dec 6th to present our videos and Dec 9th to join a panel discussion about “Video Distribution”. The video screening went well and very interesting topics came up in the panel discussion. In the panel discussion, we discussed several hot topics such as how to manage videos and we compared several method for archiving video collections. Many people wanted solutions that would make it easier to maintain, copy and distribute their collections. There was also questions like 'How do we find a simple way to copy videos? How do we get permission for copying? What should we do if we're dealing with copyright? Also, there was time to talk about how to sell video documentary. Most of the speakers and participants agreed that selling a video documentary is still a hard thing to do these days. While there have been many excellent video documentaries circulating among friends, not many of them went to the “market”. It's as if people don't or won't buy a good video, but that may not be true. The real reason for the lack of sales is that, until now, all the tools and channel for distributing video are owned by big corporations or rich individuals. Several people came with ideas about creating their own viewers in their communities by using new methods. For example using festivals and opening new spaces for youth to hang out could be options. We were also eager to share thoughts on how cable TV and internet have changed our way of life and how these technologies are influencing videomakers. Keep in mind that the nature of these tools have forcing us to change the way we produce videos and in someway, the content inside. At the end of the discussion, we came to agree that we also need to pay more attention to many old videos that are being host on our website. This is more about our responsibility to many of these video makers. There are several ways this can be done, for example, by helping to screen many of these videos, everywhere we go. And also to create more detailed information around each video, which is sort of a curatorial obligation to these old videos. A new beta version of Plumi, the free open source software which EngageMedia runs on (and develops) has been released including updating to the latest version of Plone, support for 16:9 video transcoding, webm transcoding, a new HTML5 video player, and support for the Universal Subtitles platform. We anticipate a final stable release soon. You can read more about it on the Plumi blog. Global Information Society Report 2011 Out NOW! Two of this year's reports are by EngageMedia! GISWatch is a collaborative community committed to building an open, inclusive and sustainable information society. Its report for 2011 is being launched on December 10 -Human Rights Day. Launching on December 10 --Human Rights Day-- the Global Information Society Watch 2011 report investigates how governments and internet and mobile phone companies are trying to restrict freedom online -- and how citizens are responding to this using the very same technologies. THE TSUNAMI IN JAPAN Citizens used social media to share actionable information during the devastating tsunami, and in the aftermath online discussions contradicted misleading reports coming from state authorities. Other countries include China, Iran, Lebanon and Pakistan. The report is available online for download from December 8. Watch this space for information about how you can buy a paperback copy. 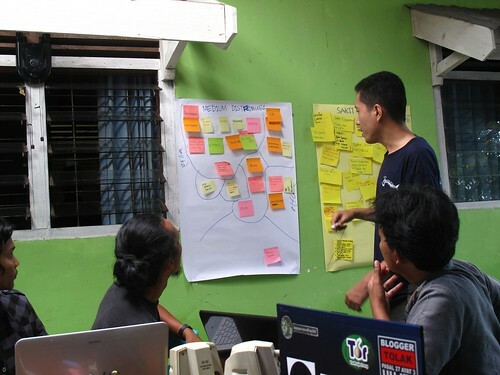 Young people are helping Riau to save its natural resources by creating and strengthening local media. A video distribution workshop have been conducted from 2-5 Dec 2011, jointly by Engagemedia and ASTEKI, People's Association Television. About dozen of young people, mostly student in Pekanbaru came and participated. Pekanbaru, the capital of Riau, a province of Indonesia, located in the center of Sumatra along the Strait of Malacca. Indonesian official language was based on the Riau version of Malay language. Riau is currently one of the richest province in Indonesia. Many students and young people now helping local news agency, Gurindam 12 (part of ASTEKI network), Bahana (student's monthly magazine), and SIAKvideo to cover news and stories about forest deforestation, illegal logging, poverty. This province is rich with natural resources, particularly petroleum, natural gas, rubber, palm oil and fiber plantations. However extensive logging lead to massive decline of forest cover from 78% in 1982 to only 33% in 2005. Engagemedia-ASTEKI workshop is aiming to share knowledge, tools, skills, to help these young people in this process. Please check our flickr and ASTEKI page to get more details.